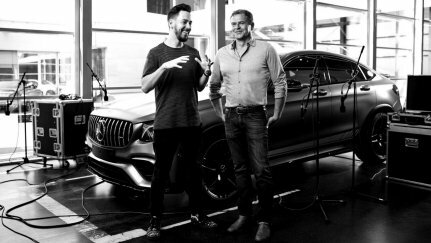 A debate about the future sound of cars between Linkin Park member Mike Shinoda and the CEO of Mercedes-AMG, Tobias Moers. 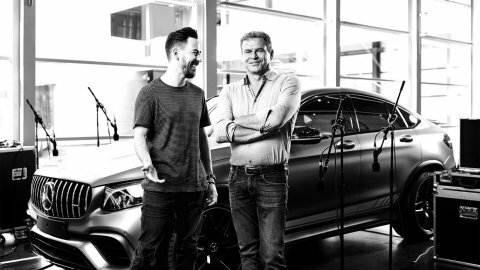 The Californian Mike Shinoda, a musician and member of the US rock band Linkin Park, and the CEO of Mercedes-AMG Tobias Moers about the future sound of cars. It is an unusual one. The encounter between the Californian Mike Shinoda, a musician and member of the US rock band Linkin Park, and the Freiburg-born German Tobias Moers, CEO of Mercedes-AMG and enthusiastic developer of high-performance automobiles, is an unusual one. But despite their different backgrounds both agree that driving a car is a multisensory experience and should remain so in the future. The automotive industry is more and more shifting to hybrid and fully electric vehicles – also in the performance segment. Yet the sound of a car remains paramount to the driving experience and the safety of other road users. Therefore, the design of acoustic “calling cards” for vehicles is of paramount importance. 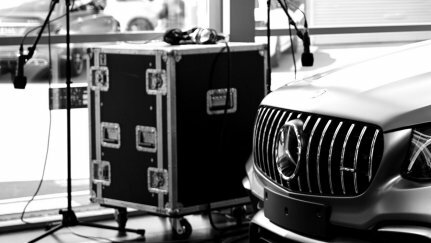 To this end the AMG team is creating sound experiences unique to their vehicles that represent the brand’s high-end, high-performance experience. The backbone of this future “signature sound” is a unique sound manual inspired by the partnership with Mike Shinoda. 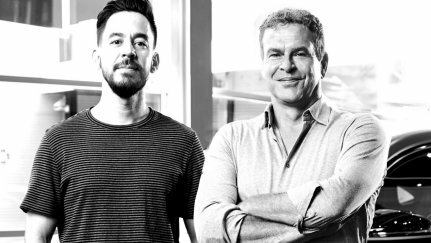 The interview with Mike Shinoda and Tobias Moers. Mr Shinoda, what role do you play in the sound development of AMG? 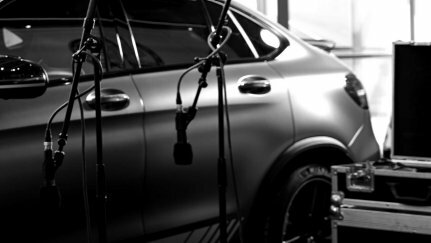 Mike Shinoda: The AMG staff has a lot of experience in creating a unique sound for our vehicles and it sounds amazing. There are many other experts in sounds and sound engineering, but their approach is a bit more scientific, which is different to mine. But, for all of us there’s always an emotional component and also a cultural connection. I think my job is to bring a different perspective to the table. Mr Moers, how do you combine the results of the sound developers at AMG with Mr. Shinoda’s influence? Tobias Moers: Sound in our definition is the emotional part, the experience an AMG stands for. So it’s all related to the powerful engine sound that stays in mind. We are working out how to unify these two elements to create the sound of the future. It’s no secret that even cars in our segment are moving toward hybrid engines. The question is, how does a car like ours sound in the future? Do you want to reveal anything about that? TM: Well, this is what we are working on now. We have just experienced years of automotive development. Creating the perfect sound is part of our approach to present multisensory experiences. This will need time and won´t be achieved overnight. MS: It felt like a history lesson. But there is a second component to this, as you gain experience doing this. You can talk about it a lot when you sit in the car. It’s like wine-tasting, when you do it, one after the other. The differences are magnifying. So is it like a multisensory experience, an experience for all the sense? MS: Of course it is. What do you think the streets of the future will sound like? MS: We’re still getting there. But I like to think big: I hope that the work we are doing here will influence the sound of vehicles for years to come. Today’s electric vehicles are very quiet, which is a good thing, but I think, in terms of multisensory experience, you need more. Will there be interactivity? Will a car owner be able to influence what their car sounds like? Will they be able to choose? TM: My kids brought up this question last weekend. They are used in customizing everything. This is something we have to think about. So maybe, in the future, you’ll be able to download an app or use different sound cards for electric cars. This shows even more how mandatory it is, for us as a brand to have a signature sound. MS: It’s interesting because what we are doing is keeping the sounds of cars alive. You want to keep those sounds natural, so they are true to what is happening in the vehicle. So it’s a similar process to converting analogue into digital sound? MS: Yes, it’s similar to good engineering or good mixing in music. If you take an analogue drum kit, there are ways to enhance the sound by changing levels, changing EQs or changing characteristics. You can make it sound more or less analogue whether there is a human playing it or not. It might end up in one mix sounding like a real drum kit and in another like a synthesized kit. It’s based on how you do it. In a nutshell, what are the plans for the future sound of AMG? TM: Right now, we have a fantastic sound experience and our costumers love it. We will make sure this characteristic emotional part of our brand will last. 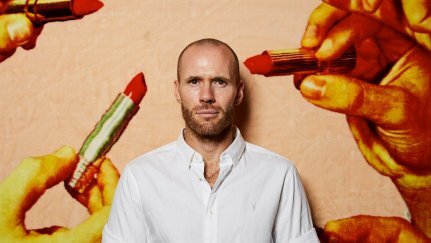 With Oliver Trevena about the Abbot Kinney Boulevard. A gentleman on the court and in life. A whiskey made out of conviction. 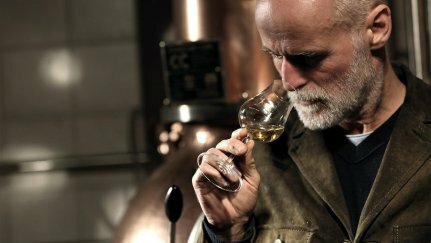 Markus Meindl and Matthias Moser about their wild whiskey.